Have some extra paper? 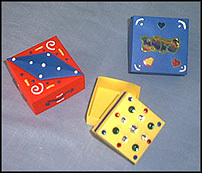 Use it to make treasure boxes for your family and friends. On this web page if you'll scroll down you'll also find pictures with the different steps of making the boxes. Have fun folding, measuring and surprising people with the boxes that you've made!